All Cleve Tools are $15.95 each plus tax/shipping. How to order! With late October release of new rates for IATSE and Teamsters/Basic Crafts, we completed our current editions. Samples to the right from previous 2016/17 editions show parts of each Tool to indicate the layouts. Each Tool is 8-1/2x11 and 20 mil laminated for ease of use and high quality. This past summer SAG, DGA and WGA, again took 2.5% wage increases and increased fringes by another 0.5% for their pension plans. Our current and new editions are listed below. We do have our 2019 calendars available as well. Send an email if you have any questions. Contact Cleve. The Movie Maker is our most popular calendar, which has the 15-month view on the front and covers all of 2 following years plus the 2019 legend of holidays on the back side. More info is further down this page. We can still provide the 2018 edition if you need. Our original 2-year calendar. One year on each side. More info is further down this page. We can still provide the 2018 edition if you need. Includes Feature rates for DGA (eff. 7/1/18), SAG-AFTRA (eff. 7/1/18), WGA (eff. 5/2/18), IATSE (eff. 7/29/18), Location Managers (eff. 7/29/18), and Teamsters & Basic Crafts (eff. 7/29/18). These rates apply until Summer 2019. Includes Television rates for SAG-AFTRA (eff. 7/1/18), DGA (eff. 7/1/18), WGA (eff. 5/2/18), IATSE (eff. 7/29/18), Location Managers (eff. 7/29/18), and Teamsters & Basic Crafts (eff. 7/29/18). INCLUDES RATES FOR LONGFORM TV SIDELETTER. These rates apply until Summer 2019. We no longer include SAG-AFTRA “Legacy” rates since they apply to only a few shows. Includes same Television rates as Hollywood TV Tool. However, this Tool INCLUDES RATES FOR NEW ONE-HOUR SERIES, but not Longform TV rates. These rates apply until Summer 2019. We no longer include SAG-AFTRA “Legacy” rates since they apply to only a few shows. Includes the IATSE rates that go into effect July 29, 2018 through August 3, 2019. Note. Teamsters Area Standards rates vary throughout the country. We provide the Atlanta rates for both Features/TV and Low Budget as a sample, while also providing for reference the feature rates for New Orleans and Massachusetts. We have made a couple of minor changes, which should be helpful to our clients. Includes the new and current rates for all New York unions in effect at this time. The New York Tool covers DGA, SAG, WGA, Teamsters Local 817, IATSE Locals 52, 161, 600, 700, 764, 798 and 829. We usually have three or four New York editions per year because several locals have very disparate contract changeover dates. This edition includes the new March rates for Locals 161, 764 and 798. Local 52 rates finally came in over 5 months past previous rates expiration. This edition also includes the new rates for Local 829 and Teamsters Local 817. 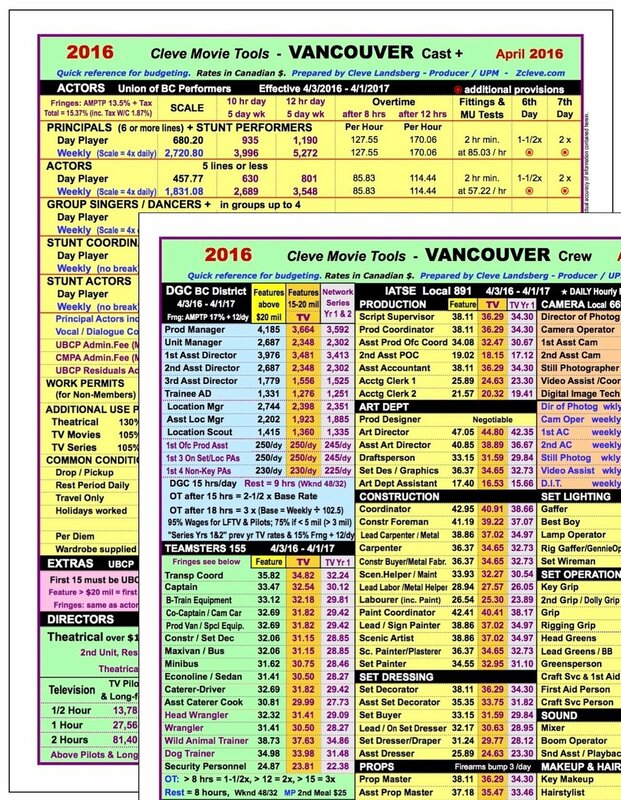 Includes rates for UBCP, DGC, IATSE and Teamsters that went into effect in April/May of 2018. These rates will be in effect until March 30, 2019. Pay by Credit Card - We accept credit card payment via PayPal - you do not need to have a PayPal account. 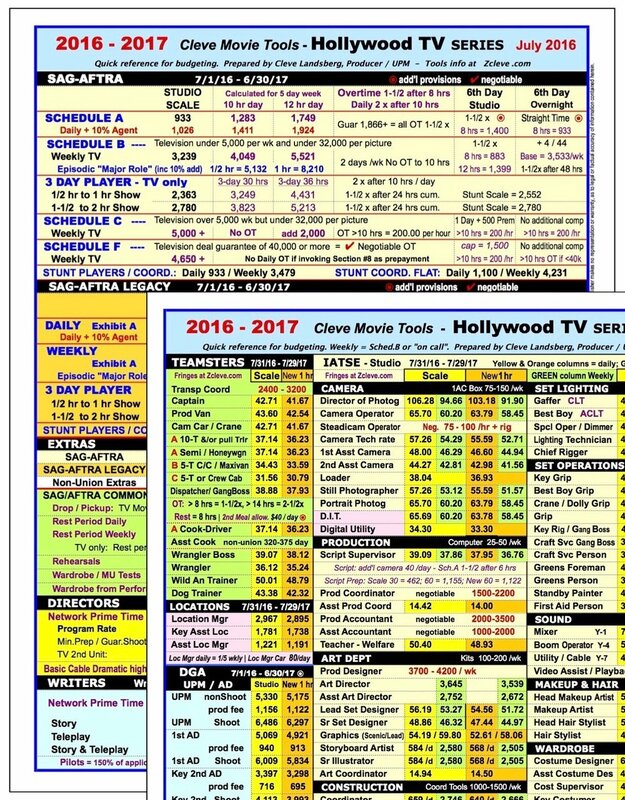 Hollywood Fringes - We have a free summary sheet on Hollywood Fringe rates, which you may find useful. Request one by email. Add yourself to our Update Notification E-mail List. You will be informed when new editions are created. Receive the most up-to-date information and access the latest Tools. 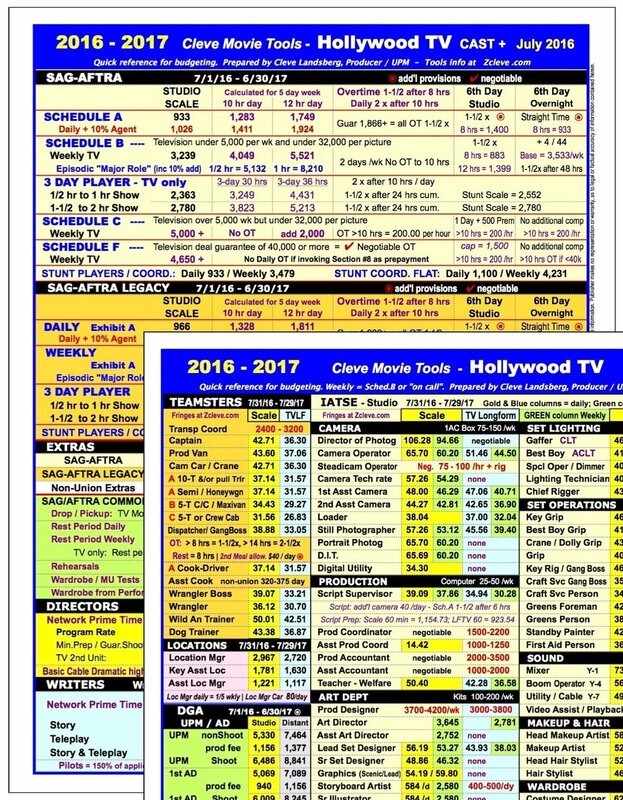 Movie Maker Calendar - 2019-21 - This 3-year calendar format was created for our clients, who need a longer view to the future. Each one is "personalized" with your name; your name with company name smaller below; or company name alone. The front-side displays a 15-month view of the current year (2019) + first 3 months of the following year (2020). On the back-side, the following 2 years (2020 and 2021) are displayed (all 24 months), plus our popular "legend of holidays" for the current year (2019). Work holidays for the USA, Canada, U.K. and Mexico are color-coded in all 3 years. 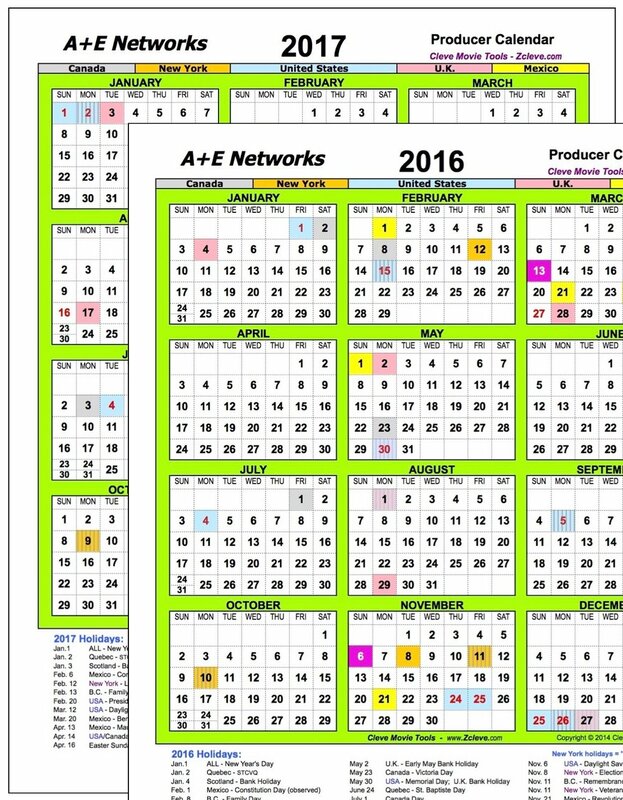 The Movie Maker Calendar is our standard for production and post-production scheduling. Producer's Calendar - 2019-20 - This 2-year calendar is also Personalized in the same way as the Movie Maker Calendar. The 2-year Producer's Calendar covers all movie union work holidays in 4 countries for the years 2019 and 2020 (each year is a full page side on the double-sided calendar). We are not currently publishing an edition for Toronto. With the new opportunities provided by state tax incentives legislation across the USA, the need to budget correctly for crews in these states is very important. The Area Standards Tool sorts out different rates and jurisdictions for the IATSE (other than LA & NY jurisdictions). It also has some of the Teamsters rates in frequently-used areas. If you’re shooting in the USA outside of LA or NY, you’ll want this Tool. This status page is updated regularly to provide you with the latest information.